While big gaming conferences like Origins and Gen Con are known for having large gaming competitions, many other smaller ones are held throughout the year at other locations. This weekend Denver will host the Yu-Gi-Oh! Championship Series. Droves of Duelists are expected to traverse their way to the highest major city above sea level in the United States for the upcoming Konami Digital Entertainment, Inc. (KONAMI) Yu-Gi-Oh! CHAMPIONSHIP SERIES (YCS) Denver on April 8-9. This ultra-competitive weekend-long tournament gives Yu-Gi-Oh! TRADING CARD GAME (TCG) Duelists throughout the United States and Canada an opportunity to compete for the Championship titles and prizes. YCS Denver Duelists will be competing for an exclusive prize card that will be awarded to the weekend’s top finishers – Number 93: Utopia Kaiser. Different from the regular cards found in booster packs and other Yu-Gi-Oh! TCG products, Number 93: Utopia Kaiser can only be obtained by finishing in the top three spots at a Main Event of a YCS, or by winning a special Public Events playoff tournament. This makes Number 93: Utopia Kaiser highly coveted by the mass of Duelists around the world that will participate in the high-level competitive YCS events during the course of the season. 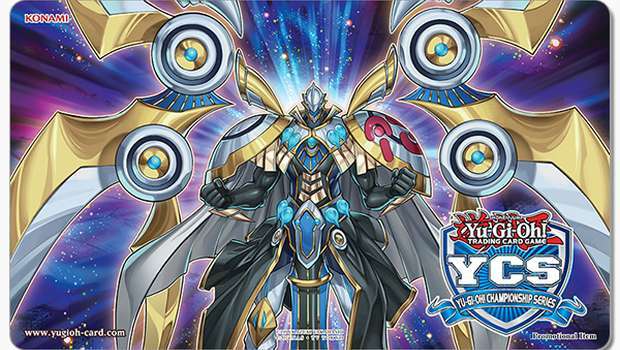 Moreover, the top-ranked Duelists will win a YCS Top Cut Game Mat for this event featuring artwork of the new prize card. For those eager to get things started, pre-registration for YCS Denver will run from 3 p.m. – 7 p.m.on Friday, April 7 and registration will continue promptly at 8 a.m. on Saturday, April 8 and Round One will start at 10:00 a.m. Upon registering, Duelists will receive five of the recently released Raging Tempest booster packs for participating in KONAMI’s YCS Denver. Players will use their constructed Decks all the way to the final match. The top-ranked YCS finishers will earn invitations to participate in their 2017 World Championship Qualifier (WCQ), plus earn valuable World Qualifying Points, that may earn them a spot in the 2017 Yu-Gi-Oh! TRADING CARD GAME World Championship. Duelists can find the answers to many of their questions here: [insert YCS Denver FAQ here once available]. Accompanying YCS Denver’s Main Event, KONAMI will also be conducting Dragon Duels (for Duelists born in 2004 or later). The Dragon Duel tournaments on both Saturday and Sunday will be sealed using Battle Pack: Epic Dawn, where each Duelist is given ten sealed Battle Packs to make a new Deck. The top four finishers in the Dragon Duel events will receive a Dragon Duel Medal, a Regional Deck Box, a Dragon Duel T-shirt, and a 2017 Regional Game Mat. Top-ranked finishers will also earn an invitation to their 2017 Dragon Duel World Championship Qualifier. The two victors from the Saturday and Sunday tournaments will face off in a best 2-out-of-3 head-to-head matchup using their own pre-constructed Decks in the Advanced Format, to determine the weekend’s overall winner and a chance at the ultimate prize: to hoist the Dragon Duel Champion’s trophy and the coveted title of YCS Denver Dragon Duel Champion! In addition, the Dragon Duel Champion will also receive a Super Rare set of the Darklord YCS prize cards. Entry to the Dragon Duel tournaments is free to qualified players. A full range of Public Events such as 2017 Regional Qualifiers, Ultimate Duelist Series Qualifiers, School Tournament Series, 3 vs. 3 Team Dueling, ATTACK OF THE GIANT CARD! !, Win-A-Mat, Sealed Starter Deck and Structure Deck, Duelist League, Yu-Gi-Oh! Day, and Generation Duel Tournaments will be held through the weekend. KONAMI will also have a photo booth set-up where attendees can make their own personalized Yu-Gi-Oh! Token Card using many new card designs! 1st place – Ultra Rare Yu-Gi-Oh! Championship Series Prize Card: Number 93: Utopia Kaiser; Yu-Gi-Oh! Championship Series Trophy; Paid travel and accommodations to the winner’s 2017 World Championship Qualifier; Invite to and VIP Status at the 2017 World Championship Qualifier tournament; PlayStation©4 Pro 1TB system; Yu-Gi-Oh! Championship Series Top Cut Game Mat; 30 Ultimate Duelist Series Points; World Qualifying Points*. 2nd place – Super Rare Yu-Gi-Oh! Championship Series Prize Card: Number 93: Utopia Kaiser; PlayStation©4 Pro 1TB system; Invite to the 2017 World Championship Qualifier tournament; Yu-Gi-Oh! Championship Series Top Cut Game Mat; 10 Ultimate Duelist Series Points; World Qualifying Points*. 3rd place – Super Rare Yu-Gi-Oh! Championship Series Prize Card: Number 93: Utopia Kaiser; PlayStation©4 Pro 1TB system; Invite to the 2017 World Championship Qualifier tournament; Yu-Gi-Oh! Championship Series Top Cut Game Mat; 10 Ultimate Duelist Series Points; World Qualifying Points*. 4th place – PlayStation©4 Pro 1TB system; Invite to the 2017 World Championship Qualifier tournament; Yu-Gi-Oh! Championship Series Top Cut Game Mat; 10 Ultimate Duelist Series Points; World Qualifying Points*. 5th–8th place – PlayStation©4 500GB system; Yu-Gi-Oh! Championship Series Top Cut Game Mat; Invite to the 2017 World Championship Qualifier tournament; 10 Ultimate Duelist Series Points; World Qualifying Points*. 9th– 16th place – 24 booster packs of Raging Tempest; Yu-Gi-Oh! Championship Series Top Cut Game Mat; Invite to the 2017 World Championship Qualifier tournament; 10 Ultimate Duelist Series Points; World Qualifying Points*. 17th–32nd place – Yu-Gi-Oh! Championship Series Top Cut Game Mat; Invite to the 2017 World Championship Qualifier tournament; 10 Ultimate Duelist Series Points; World Qualifying Points*. *The number of World Qualifying Points for the Top Cut is awarded based on the total number of WCQ invites awarded at YCS Denver after final standings. For example, if there are 32 WCQ invites, the Duelist who comes in 1st place will earn 32 points, the 2nd place Duelist will earn 31 points, and so on, down to the 32nd place Duelist who will earn 1 point. For those unable to attend YCS Denver, Duelists can follow blog-type online coverage of the event at www.yugioh-card.com/en/events and watch it via livestreaming on the official Youtube.com channel: https://www.youtube.com/user/OfficialYuGiOhTCG. They have some nice prizes, and the new points system should give a larger number of players a chance to advance. If you are in the area, you might want to stop by and even take a look as a spectator to see how many players the game brings in.